I snapped at my family because I was stressed. And I missed the most important moments of the holidays: celebrating the birth of Jesus and spending time and making memories with my family. So, maybe these 7 holiday stress-hacks I’ve learned will help you avoid the Christmas-has-gotta-be-perfect bandwagon. First, ask your family what traditions, foods or decorations are important to them. Keep those things and don’t worry about everything else. Instead of trying to do all the tasks by yourself, let your family help you. Sure, the garland might be a little lopsided, but they’ll have memories of doing it with you. Invite them to make cookies with you. (Storebought dough is fine!) Those will be priceless memories someday. Gather as a family and put together a Christmas puzzle. Drink hot chocolate and sing carols together. Cozy up together in front of the tree and enjoy the beautiful ambiance. Let one of the older children tell the Christmas story to the younger ones using the pieces of the Nativity set. Flapjacks in England are a popular treat served with tea and very easy and quick to make for even that impromptu holiday party. Don’t confuse them with our flapjacks here in the U.S., which are pancakes. They have been around for hundreds of years and even Shakespeare mentions them in his play, Pericles, Prince of Tyre, so they are definitely British! 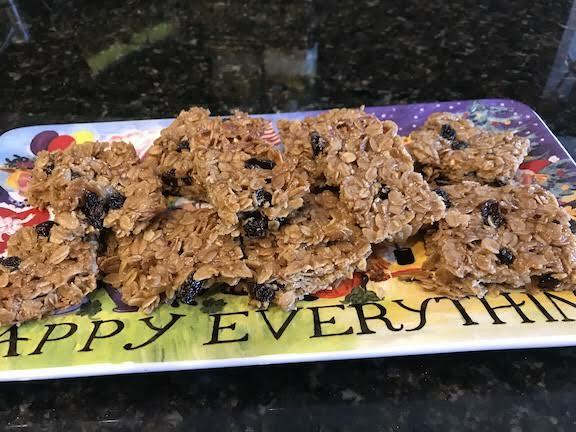 The original flapjacks are pretty simple, only four ingredients, but I love to add raisins to mine. Depending on how long they bake, they can be chewy or crunchy. Line an eight- inch square pan with parchment paper and cut into the corners for a better fit. Melt the butter in a pan with the brown sugar, syrup, and a pinch of salt until mixture is smooth. Stir in the oats until evenly covered and raisins if desired. Press the oat mixture into the parchment lined pan and spread evenly in pan. Bake for 20 to 25 minutes and lightly golden on top. Cut into squares a few minutes after taking out of the oven, before they harden, then allow to cool completely in the pan. Store what you don’t eat in an airtight container. Get more of Penelope’s recipes in every issue of Leading Hearts Magazine and on her website penelopecarlevato.com.